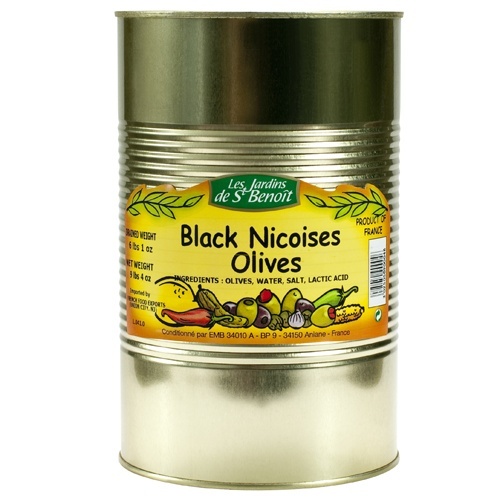 Black Niçoises olives in tin 5/1 (caliber 60/65). The Niçoises Coquillo variety is a very close cousin to the authentic Niçoises olives which are produced in the Southeastern part of France. Olives, Water, Salt, Acidifier: Acid lactic, Antioxidant: Ascorbic acid. Known to be sweet, tasty and slightly smoky, these olives can be appreciated either as snacks, appetizers or as ingredients in various dishes such as salads. Niçoises Olives are typically used in Mediterranean style cuisines (tapenades…) but can also be used in cuisines from all over the world.